The activity systems offer meaningful games for people with moderate to severe dementia, encouraging them to instinctively participate in games consisting of interactive light animations which are projected on to any table and which motivates the mind and inspires those living with a dementia to be active. 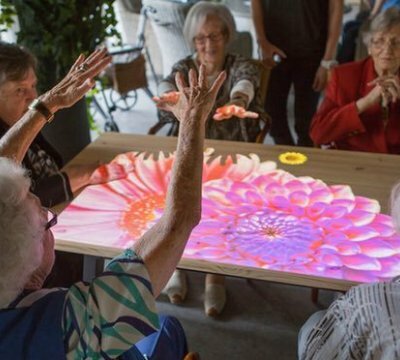 The Magic Table as it is known was developed during ongoing research in collaboration with dementia care homes in Holland and was launched in Belgium, the Netherlands and Luxembourg two years ago. 700 have been sold in the three countries, with 25 in the UK since its launch here six months ago. The games are a fantastic investment, residents can choose to engage as often as they like, through out the day or night, stimulating them both mentally and physically — both things that are a real challenge in late stages of dementia. Visiting healthcare professional have also been wowed by our investment, often requesting the opportunity to show the equipment and resulting meaningful activity to others to encourage and consider themselves this outstanding addition to our dementia service. Our approach is simple for those in our care. Everyone benefits from a calmer, more supportive social environment so we tap deep memories not lost to dementia and can bring participants back to life, enabling them to feel like them selves again, to converse, socialize and stay present.